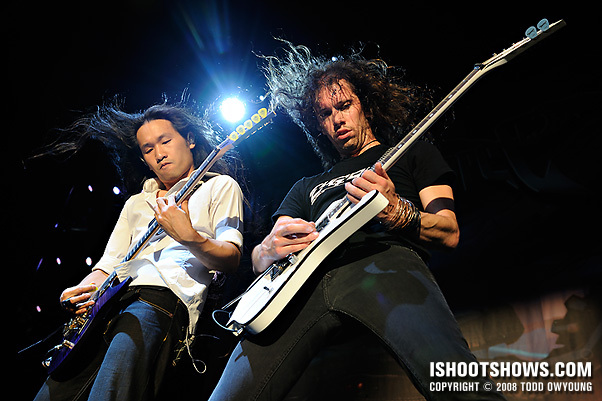 Taking the stage after Mastodon, Britain's DragonForce picked up the metal hammer and took it into the stratosphere with soaring vocals, blazing guitar solos, and epic amounts of hair. 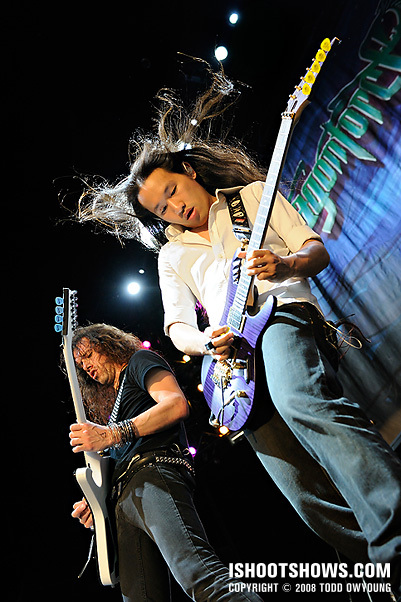 Herman Li and Sam Totman carved out much of the band's signature sound with their double-axe attack, bring their dueling guitars and luxurious locks to the front of the stage with every opportunity. Meanwhile, Frédéric Leclercq's thumping basslines and Dave Mackintosh's pummelfest on drums drove the band's amped up tempo. 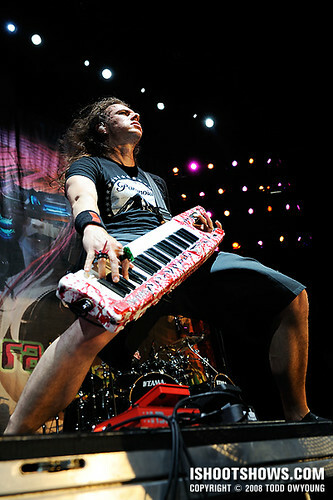 Vadim Pruzhanov crushed the ivories on his upright keyboards and Roland Keytar alike, headbanging all the while. 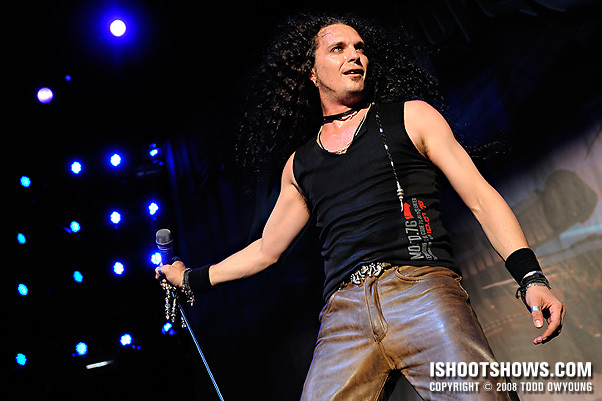 Rocking the power stance just as often as his guitar-wielding bandmates, singer ZP Theart's high-flying vocals climbed into the upper octaves to complete DragonForce's epic delivery. 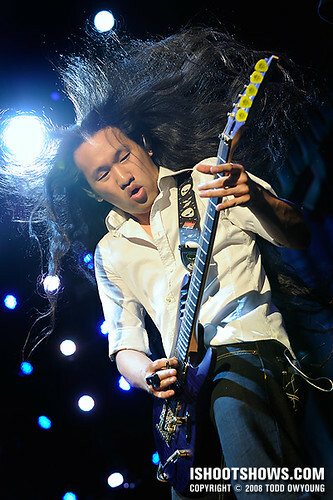 DragonForce's fourth studio album, Ultra Beatdown, is schedule for release on August 25 of this year. 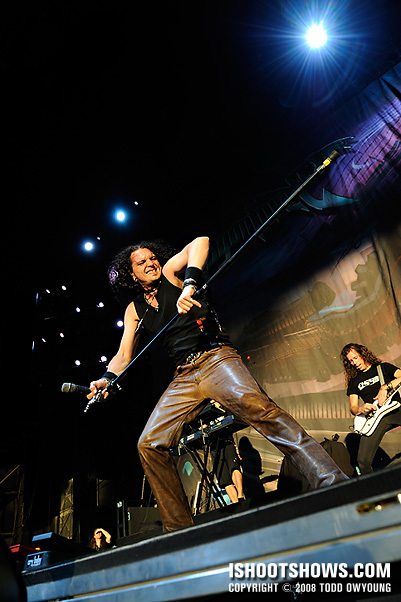 The power metal band's song “Through the Fire and Flames,” which appears in Guitar Hero: Legends of Rock, is generally regarded as the most challenging track of the hugely successful Guitar Hero series. 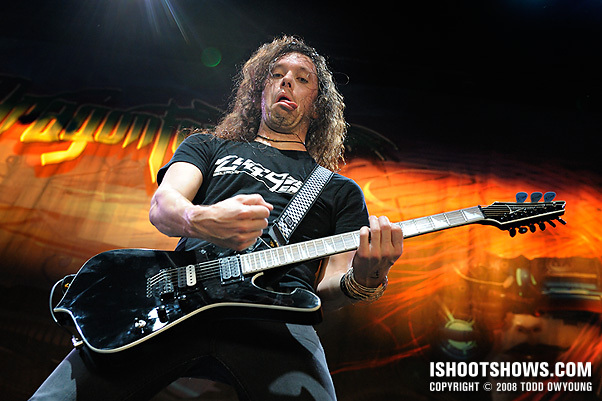 DragonForce is simply an epic, epic band to photograph. Quite frankly, I'm pretty convinced a monkey with a disposable camera could make these guys look good, because every single second this band was on stage there was something glorious happening. And most of those moments involved hair. Lots and lots of hair. 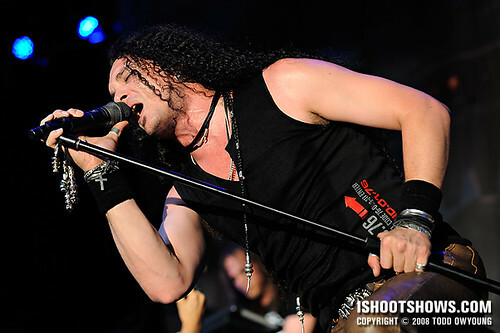 With the exception of drummer Dave Mackintosh, all the band members took turns soloing on a large raised platform at the front of the stage. Needless to say, this made for some great photo opportunities. 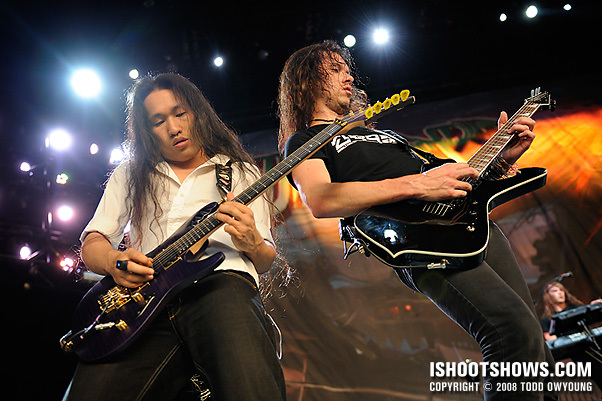 The band's guitar heroes, Herman Li and Sam Totman, took particular advantage of the riser and often played out their duels there. For most of the set, it almost felt like a game of music chairs, as the four band members at the front of the stage were constantly shifting positions and trading places. 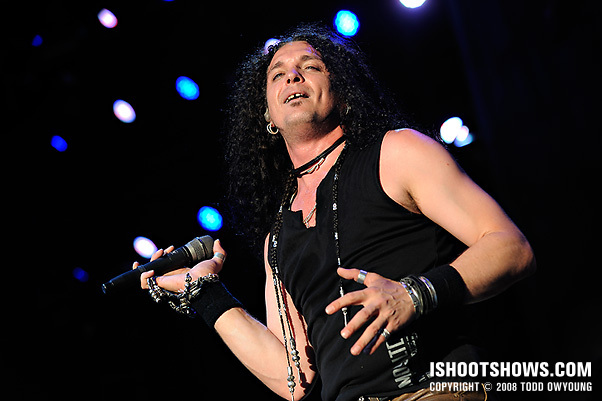 I shot this performance for the entire set. Just like Mastodon's gig, there was plenty of light, with even more warm daylight thrown into the mix of stage lighting as the sun set. Just go see this band. Please. 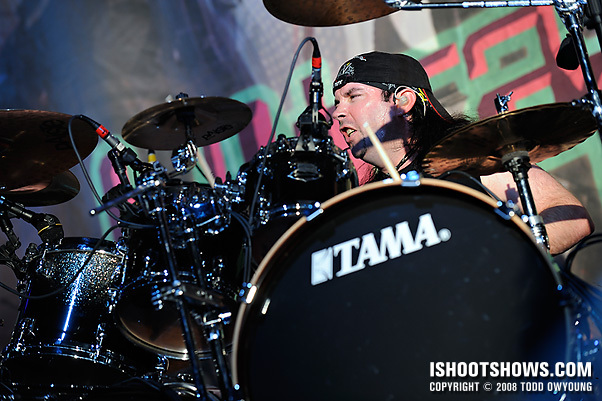 Once again, a big thanks to Amanda and Roadrunner Records for setting the incredible access. Hey Mike, thanks! Herman has no shortage of hair, it certainly makes for a nice subject in itself. They’re crisp and really coloured, I really like it, you got really good results with those flying hair. 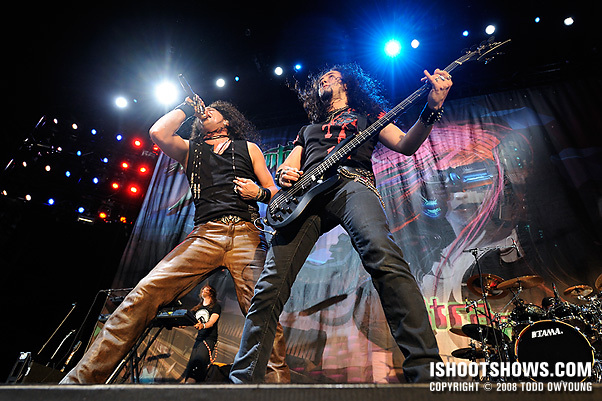 A chance you didn’t get them look GAY, they don’t like it [full story in the hilarious Ross Halfin diary on April 22nd and 23rd]. Hey DPC, thanks for the feedback. 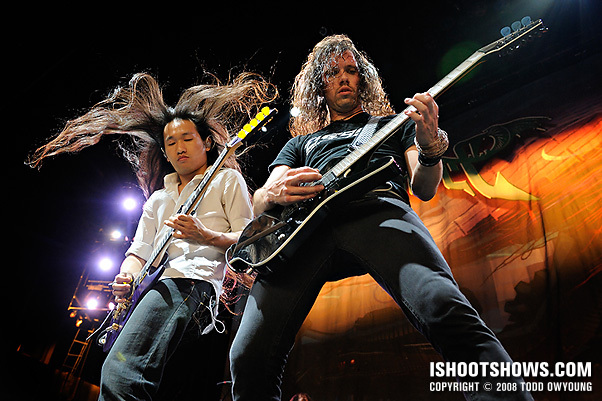 There was a huge fan in front of the main platform where the band members soloed, so the flying hair was guaranteed. I don’t know about that monkey with a disposable camera, but your shots came out fantastic! 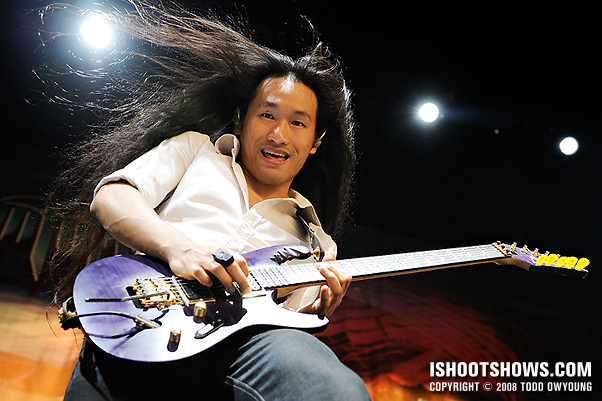 lol That guitar guy, Herman Li, he does have A LOT of hair which makes for some cool stills. Guess you seven did ok! Six posing and one recording the moment! Hey Celso, thanks for the feedback. I’ve never actually played Guitar Hero, but it seems like it would be a lot of fun. 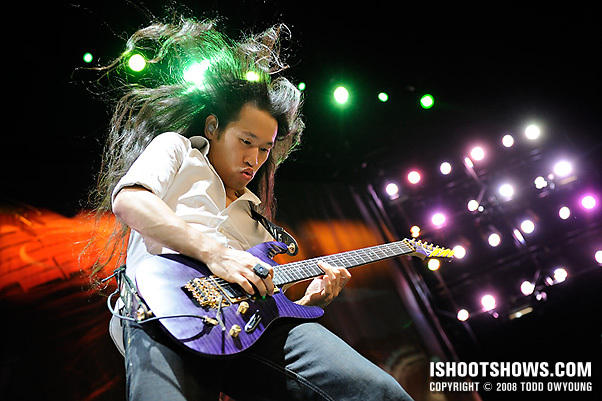 Herman Li has a lot of hair and it’s always whipping around in epic fashion. 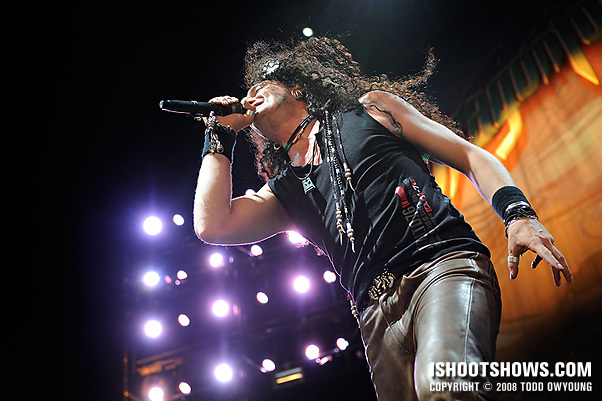 He was hands down the must fun to photograph and was at the front of the stage enough to provide plenty of photo ops. This band seems like it would be a lot of fun to tour with. Too metal for one hand! They melted my face so hard. It was like the finale of Raiders of the Lost Ark when they open the ark. You know, with the Nazis. 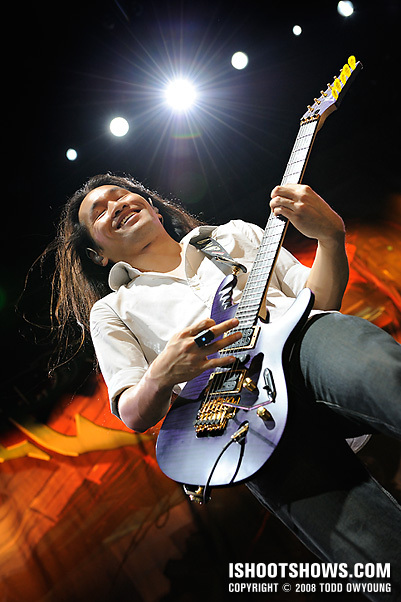 Quick thanks for your advice – played with shutter speed at Journey last night and caught some great shots. Also, your tip about opening your mouth when putting the earplugs in worked amazingly well! Thanks, Keath, glad to hear your Journey shoot worked out last night and you were able to freeze motion. Someone else told me that tip about opening the jaw and it does work. It seems to help keep the ‘plugs in better throughout a long set. DAMN boy! 3 and 7 are my faves. You worked that light like a champ. AWESOME! Hey Keith, thanks for your picks. The lighting for the first few songs of this set was fantastic. 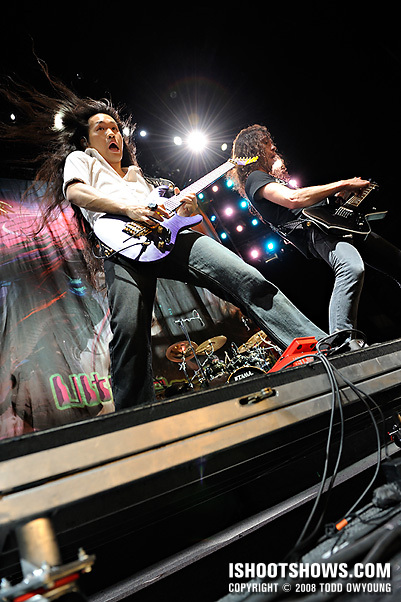 Love the flying hair of Herman Li. And as always your crystal clear pictures amaze me. OK! this shot is abso-freaking-lutely stellar. Amazing. I really am finding myself enjoying more upclose ones as of late.. dunno why. But shots like this are really where it’s at, and you got a great set! 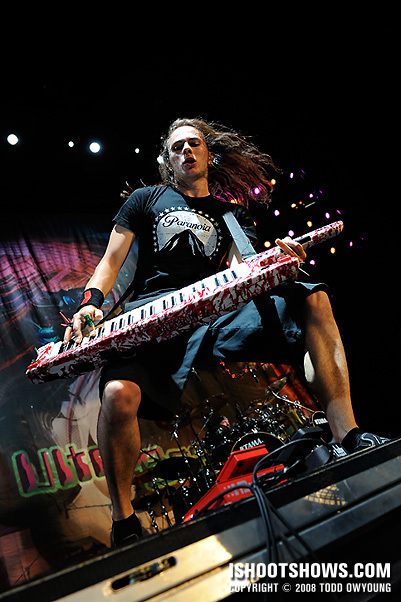 And that keytar — wow! LOVE this shot. 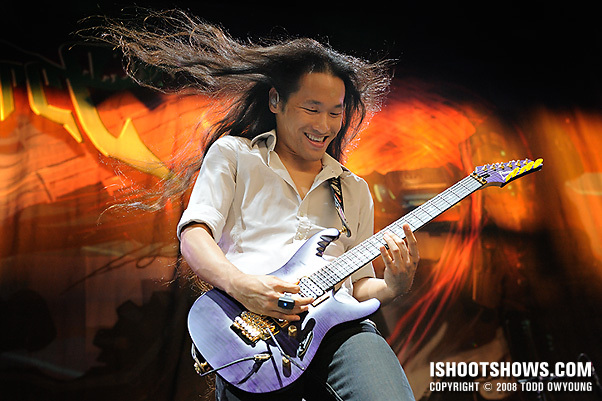 Li’s hair really adds so much fun to these photos — it adds energy, excitement… man I’m hyped up just looking at them! SHAZZAM! . Man, great set. I think I’m going to go run around my house in all this excitement now! Great images. 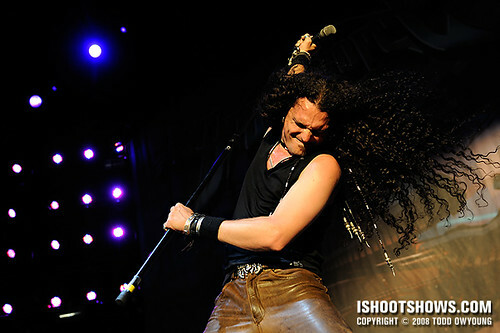 I have the great privilege of shooting Dragonforce in a few weeks in San Diego. These images/write up give me a good idea of what I’m in for!